LOGAN–Jam has been the favorite toast and waffle topper for many years. One Logan resident has decided to turn the table on traditional jams by mixing the fruit with more than just sugar. Liz Butcher has been canning and selling a variety of savory and sweet jams for over a year. Butcher started as a pastry chef for Crumb Brothers Bakery, and selling produce she grows at home at the Cache Valley Gardner’s Market. Her business, Butcher’s Bunches, focuses on making traditional and also savory fruit jams. Thinking outside of the jar, Butcher has made variations of jams mixed with chocolate, peppers and even garlic. Her jams add a unique flavor to the table with mixes like chocolate pear a l’orange which is a fusion of pears, chocolate, and orange. Her jams are not limited to toast in the morning, she said, pear a l’orange is good on a baguette with sharp cheddar cheese or used as a glaze melted over a roasted chicken. Her black raspberry garlic smash, a mixture of blackberries and garlic, she said is great on a baguette with cream cheese or as a glaze on any meat. “Let your imagination go wild,” Butcher said. 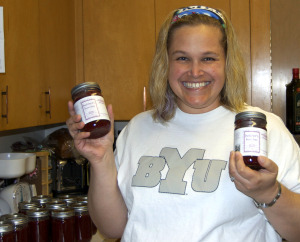 All of her jams, she said, are 99 percent made with local Utah fruit or vegetables and sell for around $7 a jar. 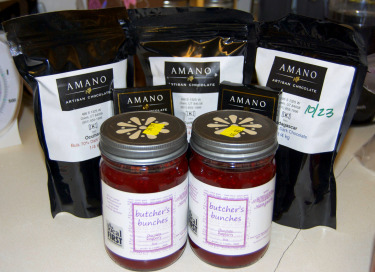 All the ingredients are made and bought in Utah, including the chocolate, made by Amano in Orem. Butcher’s Bunches has spurred a lot of attention in Cache Valley over the past year. Butcher said she started with selling her jams at the Gardener’s Market, held every Saturday from Mother’s Day weekend until mid-October. Recently Caputo’s Market and Deli has put her jams on the shelves. Butcher said she is also negotiating on selling her chocolate raspberry at Le Beau’s of Bear Lake, and other jams at specialty stores in Salt Lake. Her business, Butcher said, has allowed her a chance to showcase her jams during Winter Fest at the Bullen Center sponsored by the Gardener’s Market. Winter Fest is held Dec. 4 and 5 upstairs at the Ellen Eccles Theatre on Main Street in Logan. The event showcases 25 different artisans and Butcher is one of the few food vendors invited to come. “You are lucky to get into that one,” Butcher said. Though a few local businesses are selling her jams on the shelves, Butcher said she primarily sells out of her own home. Christmas is usually her biggest selling point of the year, she said. A lot of people use the jams as a holiday gift and Butcher has to make sure she is stocked up for the winter. Many of the fruits and vegetables come from her own garden, but what she doesn’t have she buys from local farmers in Lindon and Brigham. During the different fruit and vegetable seasons, Butcher says she stocks up and buys all that she can from the different farmers. At home, Butcher has five freezers packed full of fruit to help get through the winter. Most of the time, since fruit is seasonal, she said, people will email and ask what Butcher has in stock. She also does special orders for anyone who asks. Currently, she said, USU’s athletic director, Scott Barnes, has ordered a jar of jam for each of his department heads for Christmas. Butcher said she is making Barnes cinnamon spiced white pear jams with blue hats on the lids. Butcher said she loved working for Crumb Brother’s but she really loves being her own boss. Butcher said overall she has really enjoyed her experience experimenting with different food, running her own business and supporting other local businesses. “My Favorite part is that it’s mine,” she said.